Parks And Recreation: "Leslie's House"
I'm sure that it's probably time to retire comparisons between Leslie Knope and Michael Scott, but tonight's episode reminded me a lot of "The Dinner Party", perhaps the best Office episode to date. The set-up was roughly the same, in that the main character wants so desperately to impress the people in attendance, and uncomfortableness ensues. But the difference in how things shakes out says a lot about the hard work these Parks & Rec writers have been putting into separating Leslie from Michael—the main flaw of season one. Michael has to shoehorn his coworkers over to his house, and Leslie's workmates are game to hang out after work and help her out however they can; despite her faults, they genuinely like Leslie and spending time with her. And when things don't go according to plan, I felt terrible for Michael as I'd feel bad for a puppy who hurt his toe, and I feel bad for Leslie but more because, gosh darnit, she tried so hard and things just didn't go her way this time. I want Michael Scott to be happy, but he's making it really hard on himself. Leslie's a lot more of an optimist. She's so enamored with the idea of a dinner party to woo Justin, in fact, that she simply forgets all the details that go into throwing one, including cleaning her apartment and what exactly is going to be served during each of the five courses. ("Of what? Uh oh.") Tom, also, is scrambling with trying to impress Justin with making sure his hands are properly exfoliated (or foliated, depending on how you see it) and that he's up to date with as many facts about India as he can Google. And even the people of Pawnee get in on the action: When there's danger of their classes being canceled, they show up at Leslie's house and attempt to woo her with their mad skillz in cooking, bartending, organization (by the general from Chuck), belly dancing, fencing, caricature drawing, and accounting software choosing. But the best moments tonight came from the blind spots created when a bunch of people so desperately try to impress one another, overlooking things here and there. Mark admitting that he used someone else's story (about being on fire, invisibly) was a rare weak moment for the character, and it made me glad, for the first time in a while, that he was around for the proceedings. I'm also always a fan of backing Tom into a corner—his cocky exterior melts away so easily when anything involving his ex-wife comes up, and Leslie's decision to invite Wendy had him melting down in the bathroom at the mere thought of Ron trying to seduce her, then literally melting by ingesting a humongous hot pepper ("This is how we eat it" —> coat in mouth). Then of course when the evening is over, Leslie feels terrible about so callously abusing the teachers that she calls her own disciplinary hearing—to live out "every girl's dream" of hearing her date talk about how awesome it was under oath, whatever—and donates her own money to the workshop department so everyone gets to teach their classes. I guess that's what I love about P&R, and Leslie in general. The comedy from both comes from a place of good intentions. 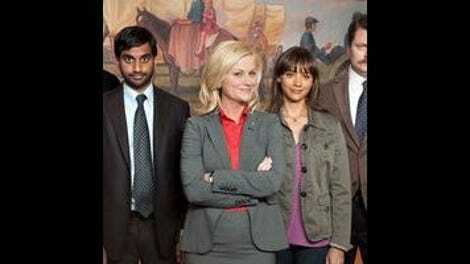 I mean, I'm a fan of sarcasm, snark, and bitterness, but in the vein of Modern Family, Parks & Rec mines humor simply from the lives of these people, no facade necessary. Happiness and comedy, back together at long last. …except for how mean everyone is to Jerry. He'd better pray another hunting trip is around the corner. "I don't have the heart to tell them what happens to Kurt Cobain in 1994." Funny how Leslie has no non-work friends. One or two should pop in every once in a while. I'm digging the flirtation between Andy and April, but am I alone in hoping it ends soon? Those two need to make awkwardness together, bow chicka wow wow. Loved how Andy was concerned about his liquor license. And Ron rushes when dinner is called. And Leslie so quickly hops over to talk to Justin when she just told Ann she was going to do so "casually." The little things about this show are really coming through.